I want this for a baby girl, nice no? Some say pink is already overused for a girl but hey it looks so lovely and nice! I am not pregnant yet, but I have high hopes. Others may think I’m crazy because I am browsing crib bedding sets and other baby stuff, well, can I just say I’m preparing for the rain? got that form the movie facing the Giants. God knows how much I wanted a baby and it’s not bad to be prepared right? 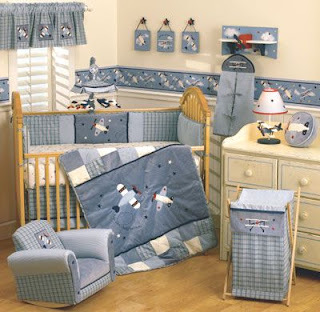 For a baby boy, I like this one, I love the soft touch of blue in it. Sigh. I can’t wait to buy those stuff.